SensitivityThe minimum detectable dose of this kit is typically less than 0.31ng/mL. This assay has high sensitivity and excellent specificity for detection of Angiotensin I Converting Enzyme 2 (ACE2). No significant cross-reactivity or interference between Angiotensin I Converting Enzyme 2 (ACE2) and analogues was observed. Matrices listed below were spiked with certain level of recombinant Angiotensin I Converting Enzyme 2 (ACE2) and the recovery rates were calculated by comparing the measured value to the expected amount of Angiotensin I Converting Enzyme 2 (ACE2) in samples. Intra-assay Precision (Precision within an assay): 3 samples with low, middle and high level Angiotensin I Converting Enzyme 2 (ACE2) were tested 20 times on one plate, respectively. Inter-assay Precision (Precision between assays): 3 samples with low, middle and high level Angiotensin I Converting Enzyme 2 (ACE2) were tested on 3 different plates, 8 replicates in each plate. 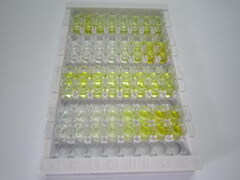 The linearity of the kit was assayed by testing samples spiked with appropriate concentration of Angiotensin I Converting Enzyme 2 (ACE2) and their serial dilutions. The results were demonstrated by the percentage of calculated concentration to the expected. 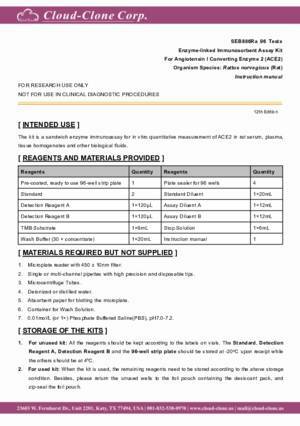 RPB886Ra01 Recombinant Angiotensin I Converting Enzyme 2 (ACE2) Positive Control; Immunogen; SDS-PAGE; WB. PAB886Ra01 Polyclonal Antibody to Angiotensin I Converting Enzyme 2 (ACE2) WB; IHC; ICC; IP. MAB886Ra21 Monoclonal Antibody to Angiotensin I Converting Enzyme 2 (ACE2) WB; IHC; ICC; IP. SEB886Ra ELISA Kit for Angiotensin I Converting Enzyme 2 (ACE2) Enzyme-linked immunosorbent assay for Antigen Detection.